The sad death of Cilla Black has highlighted the need to adapt many homes occupied by people over 65 years to prevent falls saving their lives and fall related injuries which results in major costs to health and care systems plus directly and indirectly the NHS. There are 8.7 million people over 65 in England. 1% of that population is 87,000. The 72 year old entertainer had been sunbathing on the terrace of her two storey holiday home in intense heat when she stood up, lost her balance and fell to the ground. After hitting her head she suffered a stroke and never recovered. Around one in three people over 65 and one in two over 80 fall at least once each year. Falls account for around 40% of all ambulance call outs to the homes of people over 65 and are a leading cause of older people’s use of hospital beds. The review concluded that home safety assessment and modification interventions were effective at reducing the rate and risk of falls. 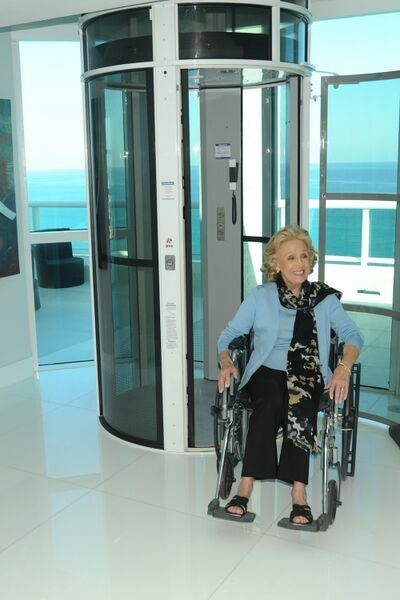 Home lift expert, Gary Tidman has been at the forefront of providing lifts for the home, be they vertical lifts between floors or stair/chair lifts mounted on the stairs in Sussex, Kent, London and the South East of England. The Sussex man from Bexhill on Sea who has been named the British Healthcare Trades Association “Individual of the Year” in recognition of the work he has done with his company, Only Lift Services in supporting people to live more independently and help adapt homes to reduce falls by older people. The most common serious injury from a fall is a hip fracture. Around 70,000 to 75,000 hip fractures occur in the UK each year. The annual cost for all hip fractures in the UK, including medical and social care is about £2 billion which works out as £26,000 per hip fracture. Adaptations even modest ones would indicate a potential reduction of 18,000 falls with resulting savings of half a billion pounds each year.